Join fellow industry leaders from the comfort of your office and tap into a wealth of information on key topics surrounding the advertising & marketing industry. Webinar Wednesdays are complimentary for members. Included below are Webinar Series that focus on a specific topic or theme.? A chronological listing of all webinars is available here. Most webinars are recorded and are available to members for playback on demand through the Resource Library. 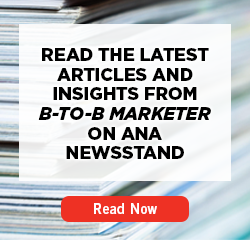 Held nearly every Wednesday at 1 p.m. (Eastern Time), ANA brings marketing thought leaders and industry experts to the web to discuss current advertising and marketing issues. ?In today's fast-paced, highly competitive marketing environment, time is of the essence. That's why our series of hour-long Webinar Wednesdays is perfect for ANA members looking to stay ahead of the latest industry trends without having to commit large amounts of time. ?